Morel mushrooms are big around here. People go crazy for them. I'm talking fanatic-crazy. Morel season is upon us, so the shroom crazies are out in full force. My friend Jerad isn't that crazy, but he did search his dad's hunting property for morels on Monday. 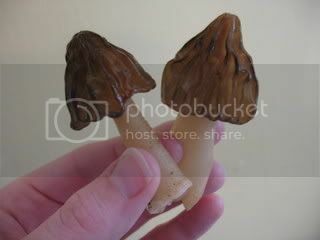 While he found a few little morels, he mostly found what he calls "peckerheads." 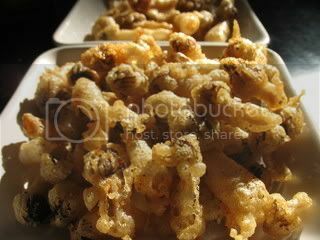 Half-free morels are easily separated from other morels by cutting them in half, lengthwise. 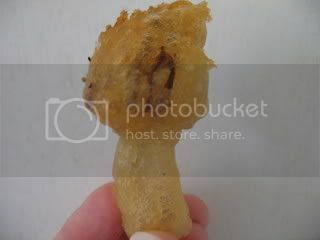 The cap of the half-free morel is attached to the stem half way (more or less; "one-third to two-thirds" might be more accurate), so that a substantial portion hangs free like a skirt. 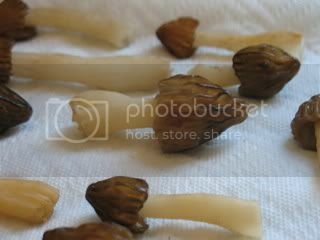 Other true morels have caps that are (again, more or less) completely attached to the stem--while false morels in the genus Verpa have caps that hang completely free, like a thimble placed on a pencil eraser. Half-free morels are edible and good, but they are often bypassed by morel hunters because they are less substantial than other morels. The caps, at maturity, are comparatively small, and the stems have a watery, fragile consistency. 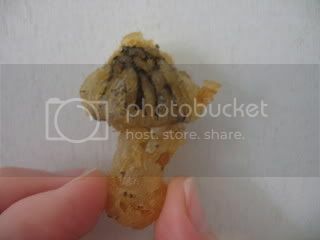 I have found, however, that collecting half-free morels is well worth your culinary time; when dried and turned into powder with a rolling pin, they make a wonderful morel "spice" that can be added to sauce. Jerad shared his bag-o-shrooms with me tonight. 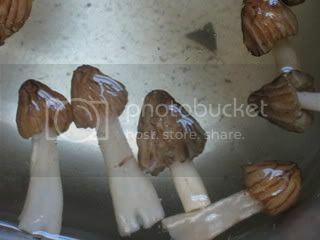 First, we soaked the shrooms to get all the dirt & creepy-crawlies out. Is that a moth down there? Then, we dried them very carefully and thoroughly. We made a simple beer batter by mixing all-purpose flour with beer. We just eye-balled the amount, wanting a thinner batter. We seasoned it with salt, pepper, garlic powder, & dried thyme. Our first batch was a bit batter-heavy. 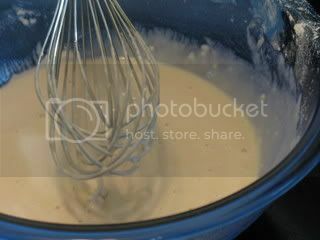 On the next batches, we shook all the excess batter off before frying. 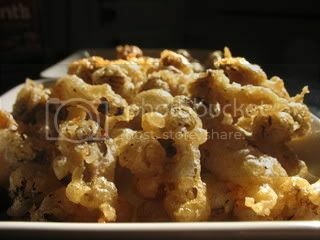 We sprinkled a bit more salt & pepper on the shrooms as soon as they came out of the oil. Wow! 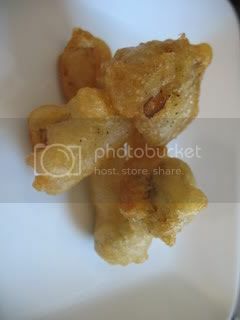 Just like tempura. I bet those are delicious! Yum. 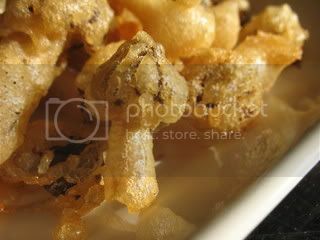 Battered and fried mushrooms were one of my favorite bar foods in college. These look delicious! What beer method should I undertake tomorrow? Light, dark, malty, hoppy? Any suggestions? I may stop at the microwbrewery by my house and see if they sell to go. They make some yumminess! 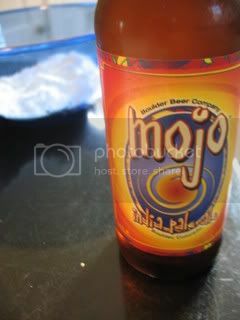 Did you drink the rest of the Mojo IPA with them? 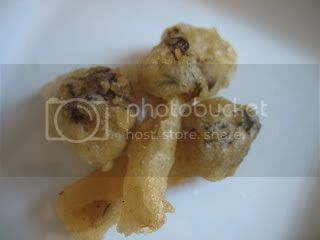 Does a super-hoppy beer seem like the right choice for mushroom beer batter? Ashby, it's all I had. But, it actually worked out well...the sour tanginess of the beer helped to cut the rich meatiness of the shrooms. A nice contrast. And it's featured in the Serious Eats newsletter I just got (posted yesterday at Serious Eats: http://www.seriouseats.com/required_eating/2008/07/photo-of-the-day-fried-morels.html) ... congrats, Kelly!